You get it. We called it Zero BS CRM to cut the crap. But the board or your boss probably won't be cool with it. Maybe you use it yourself, but this new business you want to sign up won't be down with our wordings. We get it too. 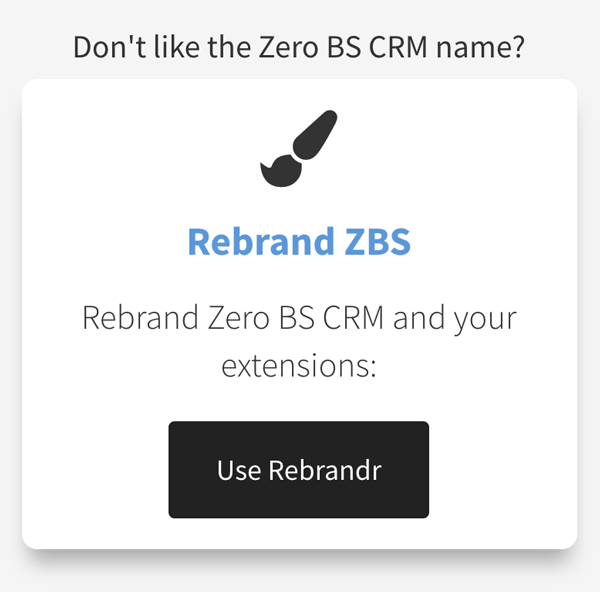 For those cases we recommend Rebrandr - it's a cheap add-on that lets you totally rename All of our CRM. Choose your own CRM name, upload a logo, & choose colours that match your brand "look and feel"
It's no secret how a lot of affiliates and business development guys make their money. They're good at generating audiences, they're great at consultancy, high-level business support etc. But that's only a chunk of their revenue. Many of our Rebrandr users are actually white-label resellers. By using our CRM white-label service, entrepreneurs are able to offer a new service to all existing clients (or an email list), without any messing about with developers, or building products. They pay us a small fee, charge the clients a substantially higher number and pocket the difference. 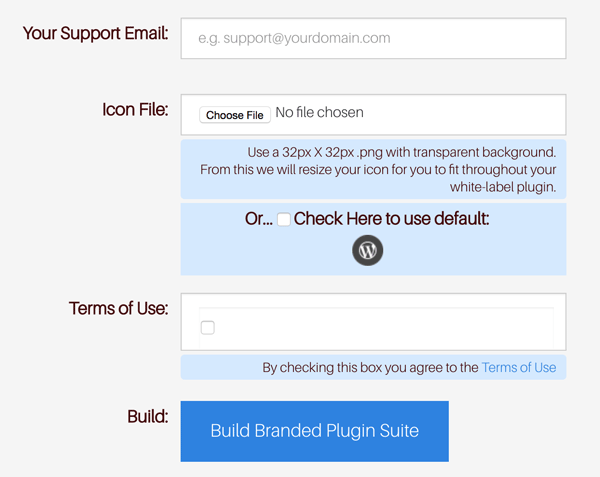 Our second version of Rebrandr is even easier to use. 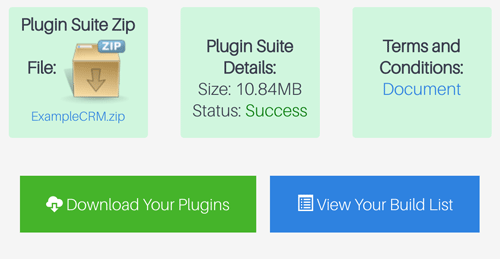 Enter your new CRM name, URL, support email and (optionally) choose a logo image, then leave it to the app to generate you your rebranded CRM Suite in a zip file! Automatic Updates served for you! After giving Rebrandr a name, url, support email etc. it goes away and rebuilds the CRM from scratch, along with all of our CRM Extensions into a single package without any of our branding. While some Rebrandr users have purchased our service to hide the name "Zero BS" from their boss or stakeholders, the majority are using Rebrandr to generate an almost-instant ROI. By generating a CRM (in seconds) which can have a name to suit your market or niche, it's usually very easy to sell to your existing clients as an up-sell or cross-sell. 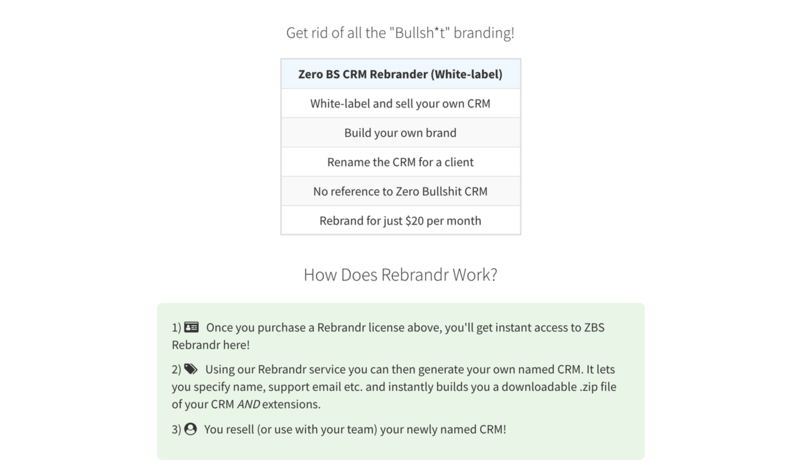 Get a CRM bundle and Rebrand! To use Rebrandr you need to purchase either the Entrepreneur, or Reseller Bundle below. 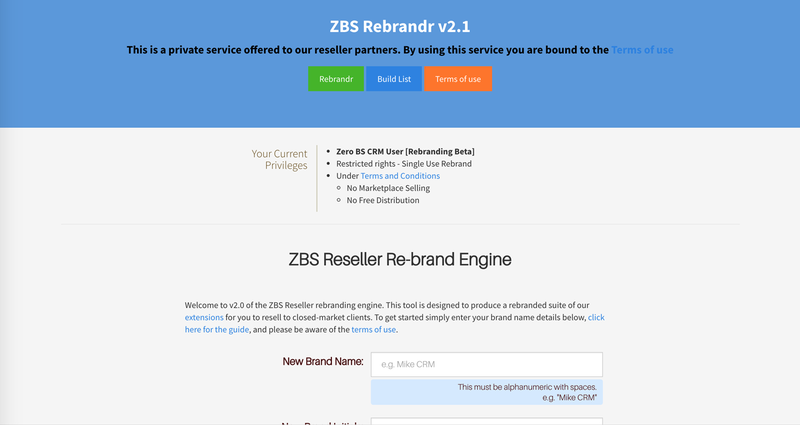 Rebrandr is a service available for free with the Reseller Bundle, or for an additional $20pcm for the Entrepreneur bundle user.